The Democratic Current (DC) decided in an emergency meeting on Monday to set five conditions for its members to participate in the parliamentary elections scheduled for March. The meeting of the umbrella formation of liberal and leftist parties comes after the death of leftist activist Shaimaa El-Sabagh in Cairo on Saturday at a peaceful protest that was forcefully dispersed by police generated widespread anger among liberal constituencies. The DC includes the left-of-centre Constititution Party, Nasserist Popular Current and Karama Party, Socialist Popular Alliance Party and the Socialist Party. Egypt Social Democratic party also attended the meeting. 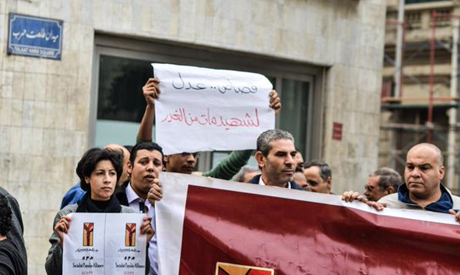 The meeting was held at the headquarters the Socialist Alliance Party (SAP) in downtown Cairo. The SAP had accused on Sunday the police of "deliberately" killing its member El-Sabagh at the Saturday protest. Khaled Dawoud, the spokesperson of the Constitution party told Ahram Online that the DC parties would make a final decision on participation in the upcoming parliamentary elections after discussing the matter with leadership bodies in their parties. Dawoud outlined the DC conditions to Ahram Online. - The sacking of the current Minister of Interior Mohamed Ibrahim. - Reforming the ministry of interior. - Amending the controversial Protest Law. - Releasing all those detained against the background of violating the Protest Law. - The conduction of a transparent investigation in the murder of Shaimaa El-Sabagh. Speaking at the meeting on Monday evening, former Nasserist presidential candidate Hamdeen Sabbahi called on president Abdel-Fattah El-Sisi to reform the ministry inorder to both protect the lives of citizens and combat terrorism at the same time. The prosecution is currently investigation the murder of the 33-year-old Shaimaa El-Sabagh. Earlier on Monday, in a press conference held at the ministry of interior, Minister Mohamed Ibrahim stated if the prosecution proved the involvement of one of the interior ministry's personnel in her killing, he would personally hand him in to be tried. Hundreds have been detained and sentenced to jail for breaking the November 2013 Protest Law which bans all unauthorised demonstrations. Minister Mohamed Ibrahim was appointed to office in early 2013 under the rule of ousted president Mohamed Morsi but kept his job after the Islamist was forced out of office in July 2013. I have yet to hear any political party say what they are for and his they plan on achieving their reforms/programs. It seems they talk to themselves and ignore the very people they say they want to represent.This is a rather strange feature of Egyptian politics. Politicians should be working in the districts they hope to represent and listening as well as talking about 'the great people of Egypt.' Without parties and religion in politics, Egypt would wind up with a Parliament divided between farmers and urban dwellers it conservatives vs liberal or rural vs effendi. In Egyptian cartoons, I have seen those with tarbooshes vs turbans. This divide is found in all societies and the rural character vs the city slicker is a theme in Egyptian film and literature. Maybe parties should be firmed after elections. In any case someone must say what they are for, offer a program. It is not enough to complain about what the other groups are doing. Reform the police? Get elected. It is childless act that shows total irresponsibility. You should asked for judicial investigations and indictment. Egypt must be a nation of law and order. Shame on you. Egypt can not be a state of law and order. In this case Sissi would be overthrown and his aides arrested and hanged for murder and crimes against humanity. This exemplifies everything that is wrong with political parties in Egypt. It is time to grow up, after 4 years of hyperbole and boycotting things when it didn't go your way the message you are sending as political entities is: we do not have the endurance to go the distance for the public, so we quit when it gets tough. The only realistic demand listed was a transparent investigation into the death of the protester. The rest is all window dressing. We've have enough window dressing. You want the other changes, then run your candidates and get it done. Making outlandish demands, that strips Egyptians from the security they now enjoy. At a time the region is infested with terror, is a not so smart way to render themselves irrelevant, right from their inception. The sad reality about Egyptian politics is that everyone is great to line up demands, and no one has any compromises to offer. You have to move forward you cannot put any condition in order to anticipate in the election. It will be new government and too many position will change, also you can negotiate who will be appointed. The time has come for all political parties to learn how to communicate, negotiate and compromise with each other. Democracy is about understanding each other without pre condition or you will be moving backward, Egypt and the Egyptians have suffered enough because political parties have not got strong leaders, who is willing to put the interest of the country above his own, also most of political leaders are arrogant, leaders think that they above every one. Please stop arguing and anticipate in the election. God bless Egypt and all Egyptians. Sissi taught us not to negotiate but decapitate our opponents.